By using the 1.7x CQ module from the FS-60Q, the FC-76 is transformed into a quadruplet f/12.6 Apo with improved colour correction and a perfectly flat field. 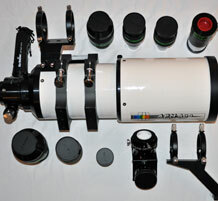 The TMB designed, LZOS manufactured, APM LZOS 115 f/7 triplet Apo refractor is an outstanding performer at home and as a travelling scope, both for visual use and astrophotography. The 1.7x CQ module converts the FS-60 into an f/10 quadruplet of almost unsurpassed optical quality giving the user a highly portable scope that can do it all. 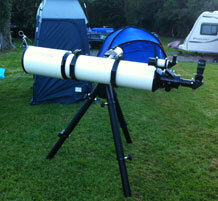 The nPAE 6061 Medium Turret is well engineered and quite fun to use, saving valuable time while observing & allowing high power work during tranquil moments because eyepieces can be switched in seconds. The Vixen SG 2.1x42 binoculars not only provide immersive views of the Milky Way and entire constellations in a way no other optical design can, but their utility in aiding star hopping thanks to a magnitude gain of +1.5 makes them very useful even if dark sky visits are infrequent.